Last week we reported on the case brought by Spain’s collecting agency SGAE against a bowling bar in Alicante, which lost on its claim that it only played “copyleft” music. Almost immediately, another case has come out, this one in favour of the claimant bar. As I reported last week, the reason for all of these cases in Spain is that Article 150 of the Spanish Copyright Law provides a defence against legal action from collecting societies if the defendant can prove that he/she does not play music of artists represented by SGAE. The new case has been won by the defendant in a sentence in Salamanca, and in a very interesting ruling that provides a detailed description of copyleft and Creative Commons. a) The traditional model, based on copyright protection, which seeks to restrict access and use of online content, by using negotiating formulae of restrictive nature and technological control measures, expressed in the so-called “Digital Rights Management”. b) A model that provides free online access to content, on occasions allowing personal use (implicit licensing models), and in other situations, the free redistribution of the work, its transformation and even its public economic exploitation, with the only proviso of citing the source. 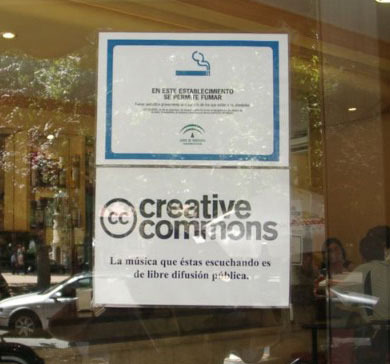 These are models of public domain and general licences (General Public License), such as, for example, the Creative Commons licences, which include a copyleft clause. A pretty impressive result for copyleft-playing locales in Spain. Besides, any sentence that uses the word ‘diabolical’ deserves my unashamed and utter respect. Excellent! Thank you for posting this useful article. While, on the one hand, as a songwriter, I would like to collect royalties on my music, on the other hand, I would like people to hear my music, so they can buy it.The agencies which supposedly collect on our behalf do not overly impress me – ours- SOCAN – only RANDOMLY scans radio for example, so see what songs are played, so the chances of an indie artist getting radio royalties are pretty slim.I would be thrilled if a club were playing my songs, and would be totally agravated if SOCAN tried to horn in.The measly royalty one might get payed would b e far outweighed b y someone hearing your tune and buying it as a download.